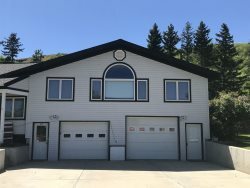 4 bedroom, 2 bath with Mountain views, attached garage, hot tub, horseshoe pit Beautiful log home that can sleep up to 14! Beautiful log home that can sleep up to 14! Just 5 minutes from the Red Lodge Ski Mountain, hiking trails, and fishing streams and lakes. 60 miles from Yellowstone National Park by way of the famous Beartooth Highway. Beautiful rock (gas) fireplace in living room; hot tub on back deck is wonderful for relaxing under the stars at night. Front deck and back deck with plentiful seating to enjoy the amazing mountain views and BBQ while enjoying the Big Sky. Cozy kitchen with all that you need. Double attached garage keeps your vehicle out of the elements. Surround yourself with comfort and beauty in this stylishly appointed Cabin with all the amenities. If you are looking for the perfect mountain retreat then you need to escape to the Red Lodge Hideaway!